As the obituary writer in a spectacularly beautiful but often dangerous spit of land in Alaska, Heather Lende knows something about last words and lives well lived. Now she’s distilled what she’s learned about how to live a more exhilarating and meaningful life into three words: find the good. It’s that simple--and that hard. 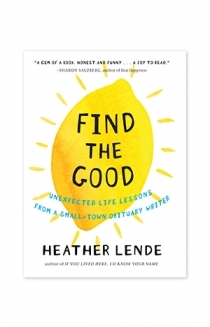 Ever since Algonquin published her first book, the New York Times bestseller If You Lived Here, I’d Know Your Name, Heather Lende has been praised for her storytelling talent and her plainspoken wisdom. The Los Angeles Times called her “part Annie Dillard, part Anne Lamott,” and that comparison has never been more apt as she gives us a fresh, positive perspective from which to view our relationships, our obligations, our priorities, our community, and our world. An antidote to the cynicism and self-centeredness that we are bombarded with every day in the news, in our politics, and even at times in ourselves, Find the Good helps us rediscover what’s right with the world.